Welcome to your free resource for writing awesome thank you notes and thank you letters for any occasion. Browse our collection of thank you note examples and tutorials and get to writing your perfect Thank You. 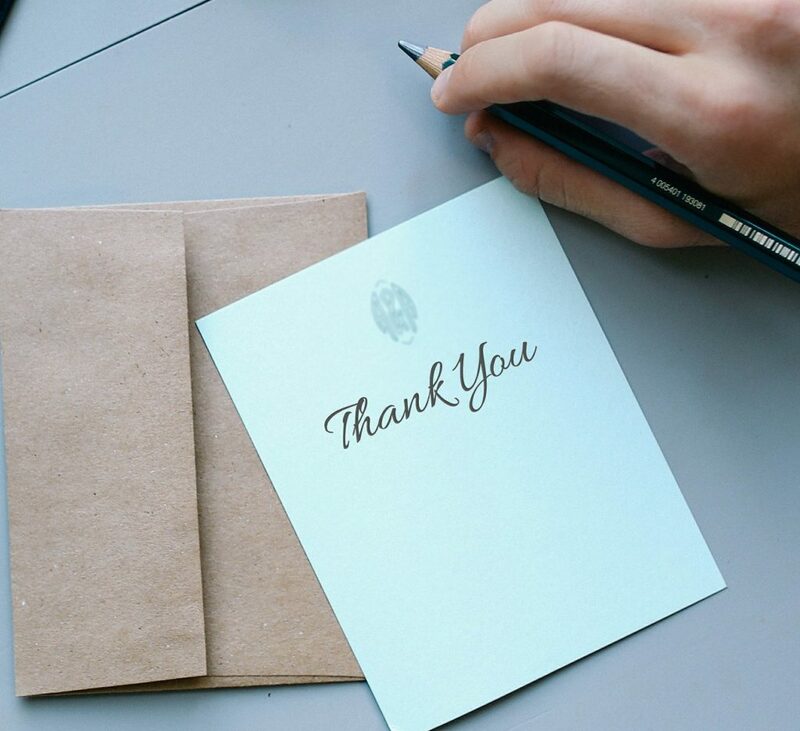 For a primer, check out our guide on How to Write a Great Thank You Note. Sometimes you just need to see some examples to get ya going. There are a lot more tutorials where that came from. Look to the sidebar on the right for a full list of example thank you notes for every occasion. Here we showcase 15 of the best thank you cards at etsy.com. Why buy your thank you cards at CVS when you can help support independent card designers? Ah, yes. The older, more buttoned-down version of the thank you note. In our Thank You Letters section, we focus on saying thanks in a professional setting. Check out all of our sample letters and e-mail templates. Also, we have a growing list of thank you quotes that are perfect to put in a thank you card. Explore are collection and add your own. What else can you stick in a thank you note? How about a nice little poem? Read example poems, and learn how to write your own. Now, you might be asking yourself, "why in the world would someone devote an entire site to such a seemingly simple gesture?" Well, i'll tell you. The first thing you're taught as a child, is to say "please" and "thank you". The world offers us little guidance on the art of saying thank you.We have a huge library or thank you note samples to show you the form, flow, and structure of a perfectly worded Thank You. Also, thank you letters are more than just a common courtesy. Did you just just interview for a job? Learning how to write a post interview thank you letter could mean the difference between a new job and unemployment. Saying thank you is one of the most important things you can do in life. And writing your thank you in note form has distinct advantages. A note becomes a memento that can be cherrished for years, sometimes even becoming an heirloom that is passed down to future generations. It may come as a surprise to you, but you are the reason this site exists. It was built for you. Without you, I'd just be writing my thoughts into a journal somewhere. But here you are. It is your interest in learning the best way to say thank you, that allows me to spend the time to put this site together. So, Thank You. You are much appreciated. In the hustle and bustle of our modern lives, lets all take a moment to thank the people around us. The people who make us happy, and bring us joy. Its time to give thanks.